This is the 300th post of SimpleDreamer.com! We have special news for you all. Hello Kitty is back to Hong Kong, again! Mong Kok shopping complex Langham Place brought yet another set of Hello Kitty displays to Hong Kong. For some unexplainable reasons, ladies in Hong Kong are rather keen in seeing this white fluffy cat who has a huge head with no mouth. There is quite a significant number of Kitty fans in Hong Kong! 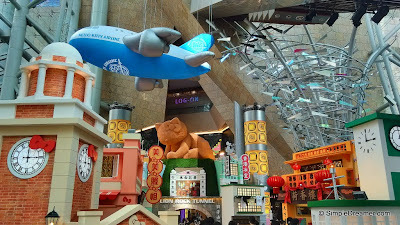 The theme for the 2011 display was Hello Kitty Back to London. In this current 2013 display, organizers took things to another level. They built a mini-version of Hong Kong in the 1960s to showcase Hello Kitty under the theme "Hello Kitty under Lion Rock Hill" (Official Name: HELLO KITTY 走過獅子山下@朗豪坊). Wish to explore one of Hong Kong's famous shopping district, Causeway Bay? The L'hotel Causeway Bay Harbour View Hong Kong offers both busy and quiet sides in one location! It is an ideal place to stay if the purpose of your Hong Kong trip is to shop and relax on the Hong Kong Island! The Hong Kong Disneyland Hotel needs little introduction. It is a hotel in Hong Kong that offers the Disney dream and magic! It is an ideal hotel for Disney fans who came all the way to Hong Kong to visit the Hong Kong Disneyland. Super Disney fans may have to choose between Disney's Hollywood Hotel and Hong Kong Disneyland Hotel as there two hotels inside Hong Kong Disneyland Resort. Is your stay in Hong Kong relatively short and you wish to make every moment counts? The Novotel Citygate Hong Kong may be a smart choice. It is relatively closed to the airport yet it offers convenience and unique shopping experiences! It's name Citygate is quite appropriate as it is the outermost 'shopping gate' of Hong Kong if you travel from the airport! Every airport has one or two hotels near by. The Hong Kong Skycity Marriott Hotel is one of Hong Kong's airport hotel! (The other one is Regal Airport Hotel.) It is an ideal place to stay if the purpose of your Hong Kong trip is to attend conferences and exhibitions at AsiaWorld-Expo! Hong Kong is a shopper's paradise. 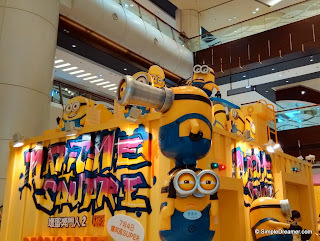 There are many shopping malls in Hong Kong. The world is flat and so is Hong Kong. Nowaday, shops in most shopping malls are the same. You can find the same names, the same retail chains, the same brands, the same layout and the same products in every malls in Hong Kong. It is not easy to find one that is unique. The Citygate Outlet at Tung Chung on the Lantau Island is a shopping mall that adds a slightly different flavour into shopping. The brands are the same, the in-shop layouts are the same, the products are the same. BUT, it is a shopping mall full of mostly outlet stores.